Warm up your winter evening with a bowl of freshly made Tamatar ka shorba – Spiced Indian Tomato soup. Flavorsome and so comforting! As the weather cools down, there is nothing quite comforting as a hearty bowl of warm soup/stew or shorba. Today, I am sharing with you a tomato ka shorba recipe that is a delicious and healthy starter. This recipe is pretty easy to make and comes together in just about 30 minutes. 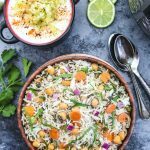 A great, vegan-friendly dish that is a must-have in winters. Why is it called tamatar ka shorba and not just tomato soup? For starters, this soup is completely different from the regular tomato soup. Shorba is a thick and spicy version of either a vegetable or meat gravy which has a soup-like consistency. 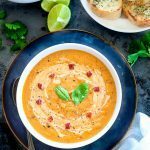 And this tomato shorba or spiced Indian tomato soup is a significantly lightened up version of a classic recipe! The preparation of Shorba dates back to Persian times. In the word ‘Shorba’, ‘Shor‘ refers to as ‘salty and ‘Ba‘ means a ‘stew dish cooked with water.’ Traditionally, shorba is prepared by simmering meat in boiling water along with salt and aromatic spices. It’s a very versatile dish and travelers used to make Shorba (meat version) on the road with whatever spice and ingredient they had on hand and that is how the term Shorba spread as far as it could. 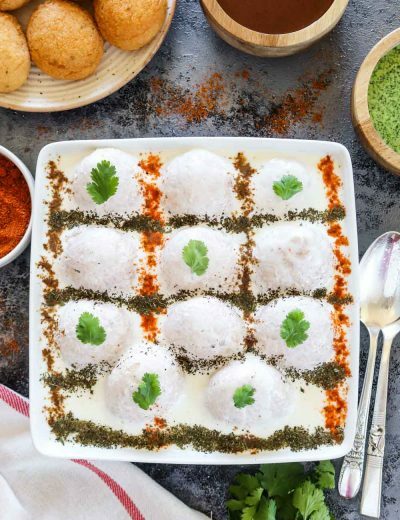 But over the years, Shorba has undergone multiple modifications with simple ingredients to suit a wide variety of taste buds and many vegetarian alternatives of Shorba have surfaced. The recipe that I have here is named after an Arabic term – ‘Shurbah‘, meaning soup. Though it may look quite similar to the soup, but the combination of herbs and spices in this recipe gives Shorba a very distinct flavor. Soup is often served as starters but Shorba can be served as an accompaniment to the main dish or in between courses. What makes up this Tmamatar ka shorba? Tomatoes, herbs, and spices like – ginger – garlic, Star Anise, Whole Black Cardamom, Bay leaves, Cinnamon, and Cloves. This is a dump-and-go kind of a recipe. Simply, wash and chop tomatoes. Add all the ingredients to a pressure cooker and cook for 4-5 whistles (20-25 minutes in a pressure cooker without whistle). Feel free to add carrots, spinach or any leafy vegetables of your choice to make it more flavorful. Tomatoes will become soft and mushy, discard the whole spices and puree the boiled mix. The essence of shorba lies in its tadka or tempering. Just before serving give a tadka of toasted cumin seeds, and this will add extra flavor and texture to this soup. Is this Shorba Freezer friendly? In cooler months, I love soup and with busy schedules something it gets difficult to cook up a soup daily so I make a big batch of this hearty shorba and freeze in individual servings. Thaw and reheat when you need a quick last-minute warm meal. makes a healthy dinner option. Pair this soup with homemade bread – garlic knots, focaccia bread or honeycomb buns to create a hearty meal. Do try this yummy recipe of tamatar ka shorba – spiced Indian tomato soup in your kitchen. Let me know in the comments if you try this recipe. If you have any questions, I would be happy to answer them. Warm up your winter evening with a bowl of freshly made Tamatar ka shorba - spicy and flavorsome Indian tomato soup. Add all the ingredients one by one. Feel free to add carrots, spinach or any leafy vegetables of your choice to make it more flavorful. Add water and cook for 4-5 whistles (20-25 minutes in a stovetop pressure cooker without whistle). Discard the whole spices - whole cardamom, cinnamon, star anise, cloves and bay leaves. Using a hand blender - puree the boiled mix. Thick soup is ready. Do not sieve the soup - why waste all the goodness. Add sugar or jaggery to balance sour flavor from the tomatoes. FOR THE TEMPERING - Heat oil in a pan, add cumin seeds and as they start to crackle add it to the soup. Bring it to a boil. Feel free to play around- add some crushed garlic to the tadka and later season with some crushed roasted cumin seeds. Adjust seasonings and add crushed peppercorns. Garnish with chopped cilantro leaves, cashew cream and serve hot. The essence of shorba lies in its tempering. Just before serving give a tadka/tempering of toasted cumin seeds, and this will add extra flavor and texture to this soup. Do not skip this step. Sure you can. Reduce the quantity of water to 1 cup. Cashew cream is vegan cream. If you are not vegan sub it with regular cream. Tried the recipe and it came out well. Was spicy and flavourful. Loved the colour too. Thank you so much for sharing. Pleasure is all mine, Ritu. Can I have this with veg biryani also ?? The best tomato soup I have ever made so far. Thank you for this excellent recipe. Thanks Rachita! Glad you liked. Healthy, Delicious and comforting soup…lovely presentation..